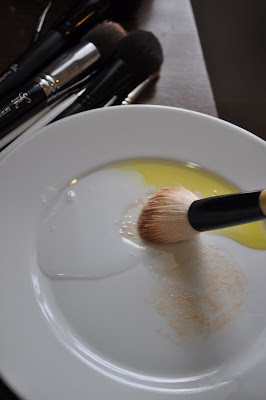 I decided to share on how I wash my makeup brushes, I used to use baby shampoo, but had a hard time washing my foundation brushes, especially my flat top kabuki brush. So I changed to using olive oil and dish soap. The olive oil just melts the makeup off the brushes and the dish soap disinfects the brushes. I wash my foundation brush every two uses. Then take the brush and sweep it side to side on your palm. I suggest using brush guards like these to keep the shape of your brushes while they dry. You want to elevate the brushes like this so all the water drains out of the brush and no water goes into the barrel, if the water gets into the barrel, this will cause the glue to weaken which will cause your brushes to shed. Just let dry for a few hours and then they are ready to use again. 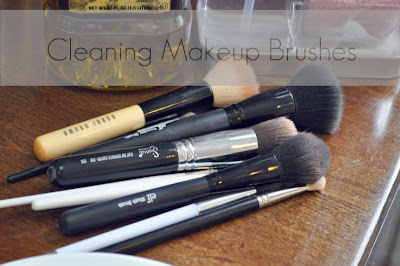 Thank you so much for visiting, tell me in the comments what you use to wash your makeup brushes. I have been using the Sonia Kashuk brush cleaner from target and like it, but may try the olive oil & dish soap once my bottle runs out. I also have and love the Sigma Dry & Shape, it does the same thing as the brush guards you use, but keeps them all together and you could also put it upside down or slanted down if you wanted to. Thanks for the post! I just tried this yesterday and it works wonders. I will forever use this method. I did this today, it worked great! Really enjoying your blog:) thank you!